I wanted to do something new this time to celebrate the visit of all my children and their partners, and my lovely grandbaby Kelly. Maybe a boat trip up Princess Louisa Inlet? Possible, certainly, but expensive for the 9 of us. And 5 hours, maybe not the best idea for a year-old baby in summer. And everyone has been swimming in Ruby Lake, going down two or three times a day to plunge into its familiar waters, so leaving our place for 5 hours or more (in order to get to the marina, etc. and then get home again) wasn’t ideal. 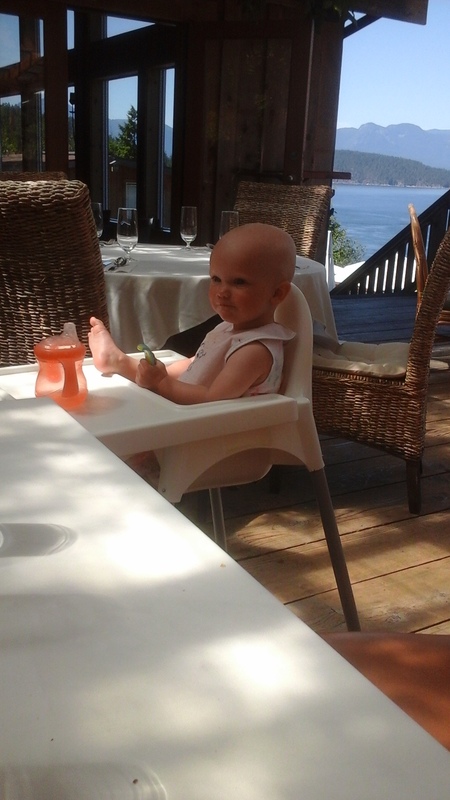 Well, what about lunch out, at a restaurant on Jervis Inlet, with the most wonderful view on earth? John was willing to treat us all so we got into our convoy of cars and headed to Egmont. Tomorrow night, a party here of local friends who’ve known our kids all their lives (pretty much). A beautiful sockeye salmon to barbeque, some chickens to roast early with tarragon, lamb to stuff with pistachios and lots of garlic. 2 desserts are on the freezer already — chocolate cake, a marbled chocolate/hazelnut cheesecake — and there are Klein Lake Trail blackberries in the fridge to make into galettes in the morning. We’d hoped to have what Manon calls “firecamp” but there’s a campfire ban in our district right now, due to months of drought, so it’s a good thing a few of us had the Campfire S’Mores at lunch today. ~ by theresakishkan on July 31, 2015. This entry was posted on July 31, 2015 at 6:12 pm and is filed under Uncategorized.You can follow any responses to this entry through the RSS 2.0 feed.You can leave a response, or trackback from your own site.